Fallout 4 Nuka World DLC, the sixth and final expansion, has a new trailer video that introduced what Nuka World is all about. The post-apocalyptic world of this once fun-filled park will be your playing ground. Nuka World is divided into different towns. You will be starting in NukaTown USA. This is where Raiders are settled in at the moment. Another town is called the Nuka Galaxy, the envisionment of what the world is in the future of the Fallout universe. Another one is Dry Rock Gulch which has a ‘wild west’ theme to it. Safari Adventure, on the other hand, is like a zoo town. The World of Refreshment, or the Bottling Plant, is an industrial themed town. The Kiddie Kingdom has all the rides for children. All these other towns will be available for the taking from settlers. You will actually play as a Raider (yes, the bad guy!) with the role of being the ‘over boss’. There will also be three different Raider gangs that will each have their different personalities: the Disciples which are the usual violent gangs, the Operators which are the techy and stealthy kind of gang, and the Pack, the animalistic and the very much crazy type of gang. In Nuka World, the armor and weapons are also distinct for each type of gang you choose. Crazy weapons can be seen which looks very enjoyable. Nuka World gives you a break from being the good guy and gets you to enjoy being the bad guy. “You are going to this amusement park, but you are also taking a break from saving people and rescuing settlements…sort of let your hair out,” said Justin Schram the lead level designer. Nuka World is out August 30th, and is available for PC, PlayStation 4 and Xbox One. 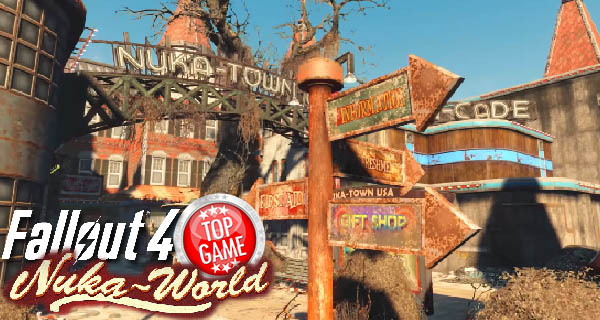 Bethesda’s Fallout 4 will be releasing their final DLC soon and it is called Nuka-World. Get to play as the bad guy in this new DLC.